I’ve been waiting to see this movie ever since I saw the first preview and fell in love with that gorgeous red hair. I’m also a sucker for accents. This movie had all the elements I look for in an animated film, or any story really. The protagonist has a mind and will of her own, and typical teenage angst. I laughed out loud several times as I recognized some of my own words from my teenage years. I loved the look on Mom’s face when Merida shoots the arrow at the last target, winning her own hand in marriage. I know that look. I’ve seen it. I’m pretty sure my mother knows Merida’s look too. The core theme of this story is “be careful what you wish for.” There were so many teachable moments and lessons, but beyond that this was a solid story with gorgeous animation and cute, quotable moments. Is it the best movie Pixar has ever done? No. But it’s good. Very good. It’s beautiful to look at, and the music is haunting. It’s an entertaining afternoon for kids and adults, and will leave you with a smile on your face and a song in your heart. At least, that’s what it did for me. 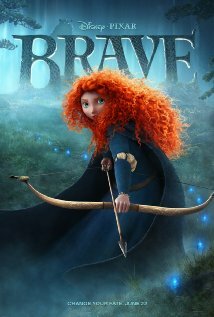 I love Merida as a protagonist. She dreams of more than being a princess, stuck in a castle, bound to follow rules and act like something she isn’t. She’s willing to take matters into her own hands, and risk everything to change her life, and her fate. But she’s young, and doesn’t realize what she asks for when she begs a witch to give her a spell to change her mother. It’s a lesson we all hopefully learn before too much damage is done. Be careful what you wish for, indeed.